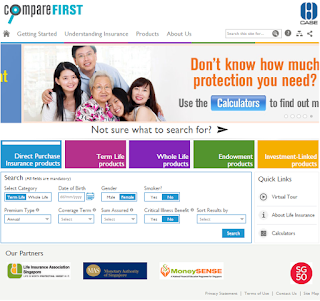 compareFIRST - Singapore's first industry-backed life insurance web aggregator has been "live" coming close to six months now. To test its user-friendliness, and usefulness, we got someone young and out of school not too long ago, who hasn't been working for too long, and does not know much about insurance to test the site and do a review. The website is simple yet very detailed for someone who doesn’t know anything much about insurances. The FAQ provided a lot of the questions I had and it was helpful because it answered most of the questions. It also gave me a better understanding of the different types of insurances. Some questions that I had were the differences between term life and whole life insurance, what is life insurance policy and the various insurance and insurance policies. The glossary page had all the terms that were used by the different insurance companies which ensured that consumers have a better understanding on what kind of products they are looking at. However, the downside to this website is that the “Sort results by:” option cannot be opened with a click, it opens only when you press and hold for direct purchase products, term life which can be quite a hassle if I was viewing it on my smartphone. The access to calculator page could be better if it opens the respective links with a click anywhere inside the box instead of opening the link by clicking the small link box. The website also has a video for people to watch if they have no clue on how to use the website. It could have been better if it was in the respective mother tongues because for people who don’t understand English it would be a hassle. The “not sure what to search for” answers the consumer’s question by doing a simple questionnaire which is good for someone who is unclear of what he or she wants. It gives consumers a better understanding on which products featured on comparefirst.sg can better meet their needs. When searching for the different products, it would be better if the search bar at the top isn’t collapsed by default. Every time I want to search for a product, I would always have to expand the column. Also, one is able to compare up to four different options available which is easier for consumers. There is a search bar that enables you to search the entire website just by keying in the keywords. There are articles provided about life insurance, like the types of life insurance available, what is a life insurance and key questions to ask when you’re considering a life insurance product. Having done the comparison on the site, I would have bought the insurance from the website itself rather than contacting the various companies to get my insurance policies however the website is just an information portal thus, the inability to do so. I would recommend users to use this site as it is a good platform for those who want to get insurance because it compares all the local insurance companies in Singapore. While it is meant to be an information portal, the biggest issue users will face after reviewing the aggregator is that they will have to make a special effort to purchase - which could be a big challenge for most.